Bhumihar Brahmins in Champaran had earlier revolted against the conditions of indigo cultivation in 1914 (at Pipra) and 1916 (Turkaulia). Then Pandit Raj Kumar Shukla persuaded Mahatma Gandhi to visit Champaran and the "Champaran Satyagraha" began. At around the same time the Indian National Congress in December 1916 passed at Lucknow a resolution requesting the Government to appoint a committee of both officials and non-officials to inquire into the agrarian trouble facing the district. Gandhi's historic visit to Champaran was opposed by the British rulers. An order asking him to leave Champaran was served upon him as soon as he arrived at Motihari. Gandhi defied the order. Of the several prominent persons who rallied round him, mention may be made of Dr. Rajendra Prasad,Acharya Kriplani, Mahadeo Desai, C. F. Andrews, H. S. Pollock, Dr. Anugrah Narayan Singh, Raj Kishore Prasad, Ram Nawami Prasad and Dharnidhar Prasad. After considerable struggle the Government was compelled to lift the ban on Gandhi's stay here. For the first time on Indian soil Satyagraha (Non-Violence) was successfully put to the test. Eventually a committee of inquiry was appointed by the Government under the chairmanship of Frank Shy. 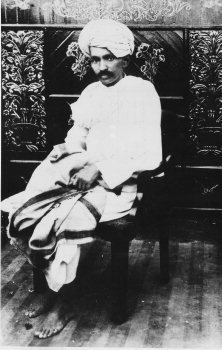 Gandhi was also made one of the members of the committee. On the basis of valued recommendations of the committee, the Champaran Agraria Law (Bihar and Orissa Act I of 1918) was passed. In 1920, Gandhi made an extensive tour of Bihar before launching the non-co-operation movement, which earned full support in the district as well. In 1929, a group of volunteers from Champran district came to demonstrate against the Simon commission. In the same year the 21st session of the Bihar students conference was held at Motihari. As a reaction against the failure of the round table conference held in 1932 there was a popular gathering at Motihari to take the pledge for Independence. Police fired upon the gatherings and charged the demonstrators, armed with lathis. In course of time, the development of synthetic dyes made the cultivation of indigo redundant. The fact that he was committed to abstention from political agitation during the war did not prevent Gandhi from championing just grievances which could not brook delay. In the summer of 1917, he went to the indigo-growing district of Champaran and took up the cause of the tenants against the European planters. The same year he led the textile workers of Ahmedabad in a strike against the mill-owners. The following year, he agitated for reduction of land tax in Kaira district where crops had suffered from the failure of rains. The local officers were perturbed by Gandhi’s activities but the Government was anxious not to precipi9tate a show-down. Gandhi himself took care to localize these conflicts and sought solutions which secured a modicum of rustice to the workers and peasants without creating a national crisis.